There are tons of great pumpkin recipes circulating on the web right now for Holiday Cooking, so I thought I’d highlight a few that I thought you all might enjoy. 1. Baked Pumpkin Mac & Cheese: Mac-n-Cheese gets a pumpkin twist with this gorgeous cheesy casserole. I can totally see serving this up for dinner on a busy school night or serving it at a party with friends. 2. Pumpkin Granola: This is our new favorite breakfast recipe. 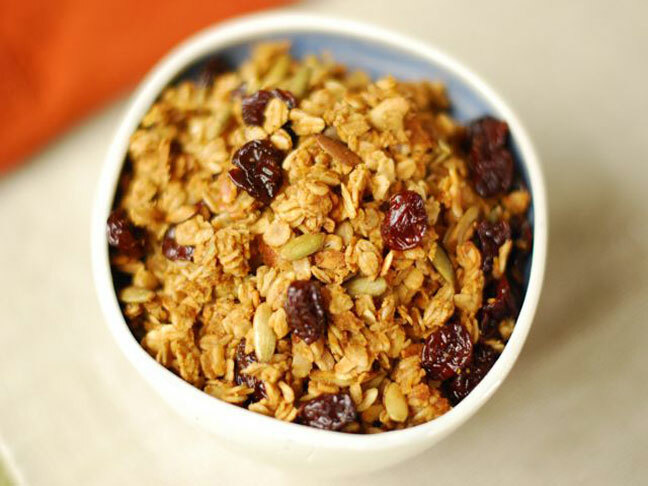 I love baking large batches of granola when I have free time and munching on it all fall long. It is even great for packing in snack traps and taking on the go! 3. Roasted Pumpkin Seeds: And perhaps the simplest of all pumpkin snacks…..roasted pumpkin seeds with delicious spices are a wonderful healthy snack for kids and adults. Sprinkle them over yogurt for a salty sweet snack, or just leave them in a bowl on the counter to munch on the run.